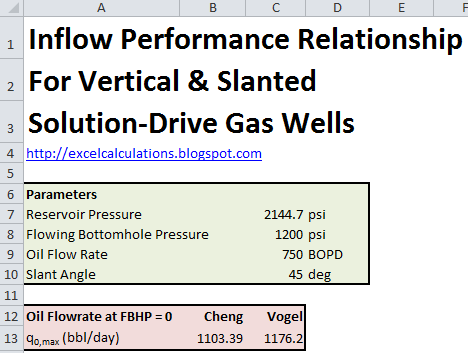 This Excel spreadsheet calculates the Inflow Performance Relationship, or IPR, for vertical and slanted solution-gas drive wells. The IPR of a well determines the relationship between its flowing bottom pressure, and the well production rate (or deliverability). IPR also helps engineers investigate the economics of a well, and is critical in optimizing the well, artificial lift design and determining the nature of the surface equipment. For single-phase fluids, the IPR relationship is linear. However, when two-phase liquid and gas below its bubble-point pressure are produced, the relationship is non-linear. Several researchers have studied this process, most notably Vogal (1968) and Cheng (1990). 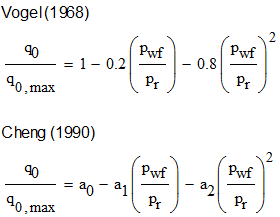 Cheng's semi-empirical correlation is applied to slanted wells, while Vogal's work applies to vertical wells. a0, a1 and a2 are empirical parameters that vary with the slant angle. In the spreadsheet these parameters are listed again several values of the slant angle. Intermediate values are linearly interpolated.